The SE370 Sea Eagle Kayak is a highly popular kayak because of its great looks, roomy interior, and an impressive 650 pounds weight capacity. This pro package is the top favorite because of the deluxe seats it comes with. The seats on this kayak are simply luxurious and the most comfortable we've seen in a kayak. Well designed, adjustable, and equipped with thick inflatable cushions, you can sit on them all day without experiencing discomfort or aches and pains. The canvas covering means that whether it is blazing hot or near freezing cold, the seats won't be affected. One of the best inflatable kayaks on the market, the Sea Eagle 370 comes with the benefits of easy setup, storage, portability and a friendly price. When it comes to durability, there's nothing to worry about with this inflatable kayak. It is really well made to last many years. The material is thick and tough and can resist damage by pebbles, rocks, dog claws, saltwater, and UV rays. With a 650 pounds weight limit and plenty of room, this kayak can comfortably carry two adults and one or two kids or two adults and two small dogs or one large dog. It is sure to become a family favorite bringing joy and fun to everyone. Read on for everything you need to know to decide whether the Sea Eagle Inflatable kayak is the one you've been looking for. 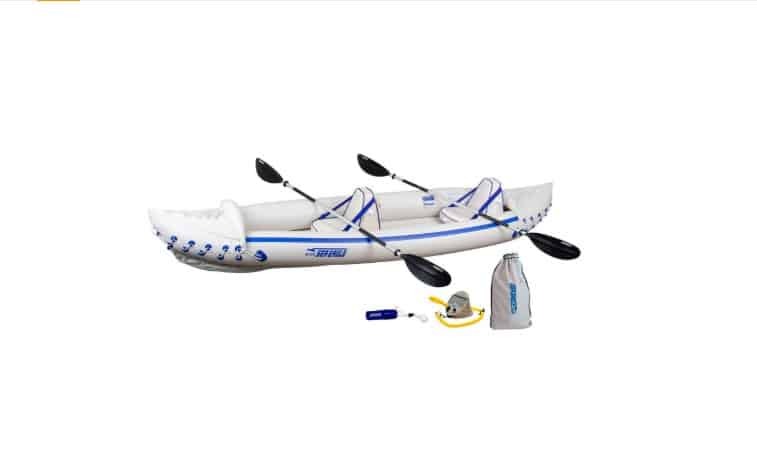 Inflatable I-beam construction makes the floor extra rigid and the kayak easier to paddle. Natural chines improve speed and tracking. Two rear positioned skegs enable the kayak to track smoothly and go faster. Three chamber construction: port, starboard, and floor. If one chamber pops, the kayak will still float and make it to shore. One-way valves with a larger opening for quick inflation and deflation. A self-bailing drain valve, which is especially handy when using the Sea Eagle 370 as a whitewater kayak or an ocean surf kayak. Grab handles at the front and rear make it easy to get back into the kayak when on the water. Portability and Setup: An inflatable, this Sea Eagle Kayak is easier to carry and transport than a hardshell kayak. Folded and packed into the carrying bag it comes with, it is small enough to fit into just about any car. However, it is a little on the heavy side for one person to carry alone and definitely not a kayak to hike with. Its dimensions when inflated makes it awkward for one person to maneuver it. Purchasing a cart will make moving it to and from the water easier. When you’re not using it, it stows neatly in a closet awaiting the next expedition. No need for kayak roof racks or tie-downs. It takes about 15 minutes to go from taking the kayak out of the car to seated and ready to paddle away. The one way air valves and included foot pump make inflating this kayak a breeze. It’s amazing how much air is pushed into the kayak with one push of the pump. There is no need to spend extra money on an automatic pump unless you want to. It takes about 8 minutes to inflate it and a pressure gauge is provided as a guide to inflating the boat properly. Usability: What makes the Sea Eagle 370 Pro Package stand out are the deluxe seats it comes with. These seats are probably the most comfortable you’ll find in a kayak. They are well formed, adjustable, offer very good back and rear-end support, and don’t get hot or cold in response to the ambient temperature. You can kayak for as long as you since discomfort, aches and pains won’t be issues. There is plenty of room onboard for two adults of any size and one or two kids in the middle or two adults and and two small dogs or one large dog. It also works as a one person kayak. Just take out one seat and reconfigure the other for one-person paddling. As a single person kayak, there is enough room for fishing gear, picnic stuff, and camping gear. Pockets on the back of the seats are great for accessories and personal devices. Performance On the Water: The Sea Eagle 370 is a versatile kayak you can use in rivers, lakes and the open ocean for recreational paddling, fishing, yacht tending, or skin diving. It performs flawlessly on cruises around smooth lakes. Rated for class III whitewater rapids, it is also very sturdy and handles small chop well. As for wakes from motorboats, it is flexible and rides right over them. We wouldn’t take this boat out on very windy and/or choppy conditions though. Does this Sea Eagle inflatable kayak cut through the water as easily as a hard body kayak does? Not quite but it does move through the water easily and is quite fast. Thanks to two rear mounted skegs, it is very easy to row and tracks straight and true even in light breezes. Just be sure to position the seats right. With both ends of the kayak looking the same, it is easy to position the seats facing backwards. If you make this mistake, the kayak will spin in circles. For reference, the ‘Sea Eagle’ logo points to the front. Even though it rides high on the water, it is very stable and difficult to tip. It is referred to as a three person kayak but there is not enough room for three adults. Price: 100% – The cost vs quality, features, and convenience makes this a fantastic value. Its such a great value for such a high quality, durable, and versatile kayak and a pro package. Material: 100% – The 38-millimeter Polykrylar material is formulated for greater strength, reliability, and durability on the water. It is very thick and tough enough to not fall apart when dragged on sandy or rocky beaches, not puncture due to a dog jumping in and resists degradation by the sun’s rays and saltwater. It also cleans up nicely. The skegs are an almost indestructible molded plastic that will not be harmed by hitting rocks or beaching. Design: 95% – With the deluxe seats, the rigid floor, and the multiple chambers, this is a well thought out and well-built boat for comfort, safety and versatility. A good looking boat that handles very well on the water, it is an attention getter. Be ready to receive compliments and chat about it with strangers. Overall: 98% – Sea Eagle kayaks are well made for performance and durability and the Seal Eagle 370 is no different. This is a high quality, comfortable and versatile kayak offered at an amazing price. It is definitely one of the best inflatable kayaks and tandem kayaks. Get the SE370 Sea Eagle Kayak if you’re looking for a versatile kayak that can work as a single, tandem and family kayak and that you can use in all but the choppiest conditions. The roomy interior, high capacity and incredibly comfortable seats this package offers will suit your needs. You will also love the quality, the ease of inflation and setup, and the ease of rowing. Does the Sea Eagle 370 sound like the perfect kayak for you? Have you tried it on the water? We’d love to hear your thoughts! Let us know in the comment section below. The SE370 Sea Eagle Kayak is a highly popular kayak because of its great looks, roomy interior, and an impressive 650 pounds weight capacity.